Air Transat is the Skytrax 2018 World’s Best Leisure Airline as voted by the passengers and has provided a much-loved service between the UK and Canada for over 30 years. Fly from London Gatwick direct to Toronto, Vancouver, Montreal, and Calgary, with connections to Québec City. You can also depart from Manchester direct to Toronto or Vancouver, or Glasgow direct to Toronto, with regular connections across Canada. Add Option Plus for a checked bag of 23kg, priority airport services, complimentary seat selection, free welcome snack & alcoholic drink and an onboard comfort kit. 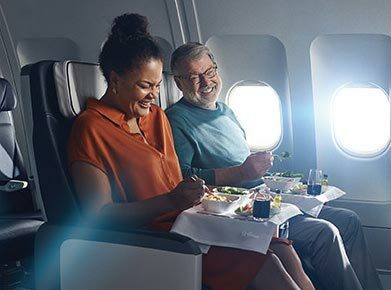 Club Class passengers get extra room and comfort in an exclusive, 12 seat cabin, with gourmet meals from celebrity Québec chef Daniel Vézina, complimentary bar service & snacks and a personal amenity kit. Passengers may bring a generous baggage allowance of two checked bags up to 32kg each, breezing through the airport with priority services. For customers with mini-globetrotters aged 2 – 11, it’s free to join the Kids Club for priority services at the airport, a member’s kit filled with travel goodies, on-board surprises plus free seat selection and exclusive contests to win family vacations. 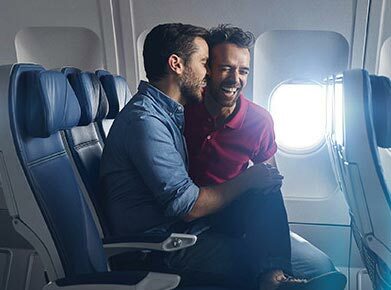 Air Transat’s Economy Class offers a warm welcome and personalized service, with unparalleled comfort, ergonomic Italian-leather seats, a dedicated crew and an inflight entertainment system. Airbus A310: Enjoy the shared cabins screens or download Air Transat’s CinePlus A app, available on the App Store and Google Play Store, prior to boarding. Once on board, access the content via the plane’s WiFi network. In Air Transat’s efforts to continually improve the inflight meal options, they now offer a new Bistro Menu to passengers on all transatlantic flights. A choice of two hot dishes, served with salad and sweet treat, will be offered per flight. Sit back and relax in an exclusive cabin with spacious and comfortable seats. Travel in style with two pieces of checked baggage, priority services at the airport and our gourmet Chef’s Menu by Daniel Vézina. Club Class offers more spacious and reclinable seats with pillows and various amenities to ensure your comfort on board so you can relax or sleep in peace.